Pseudoaneurysm is a rare but potentially fatal complication in chronic pancreatitis. The proposed mechanisms for the formation of the pseudoaneurysm suggested the prevalence of pancreatic enzymes at the peripancreatic region or within the pseudocyst that causes erosion of the adjacent arterial wall, leading to vessel rupture into the surrounding cavity or the pseudocyst sac. Mortality rates for pseudoaneurysm rupture can be as high as 70% depending on the condition of the patient, additional comorbidities, the location of the pseudoaneurysm, and the treatment received. The incidence rate for jejunal artery pseudoaneurysm, whether with or without association to chronic pancreatitis, is exceptionally infrequent, with only a handful of cases ever reported. We present a rare case of a 37-yearold patient with a gigantic (10.3 cm in maximum diameter) pseudoaneurysm arising from the 1st jejunal artery with active contrast extravasation into the pseudoaneurysm sac observed under computed tomography angiography. Given the rarity of jejunal pseudoaneurysms, this is the largest size ever reported in current literature. We propose the noteworthy size is linked with continual irritation from surrounding chronic pancreatic inflammatory reactions, resulting in the increased elasticity and pliancy of the pseudoaneurysms/pseudocyst walls. This case report also offers an example of successful endovascular intervention for jejunal pseudoaneurysm in which surgical intervention is technically difficult or even impossible. Visceral pseudoaneurysm is uncommon, but can potentially be life-threatening due to high risk of rupture [1,2]. The most common causes of visceral pseudoaneurysms are secondary to pancreatitis and trauma . A commonly suggested etiology of pancreatitis related visceral pseudoaneurysm formation is the prevalence of pancreatic enzymes, whether at the peripancreatic region or within a pseudocyst, causes degradation of the adjacent arterial wall, leading to vessel rupture into the surrounding cavity or even into the pseudocyst sac . Splenic artery is most common artery involved, followed by the hepatic arteries and superior mesenteric artery . The involvement of jejunal artery is exceptionally rare and not well documented. 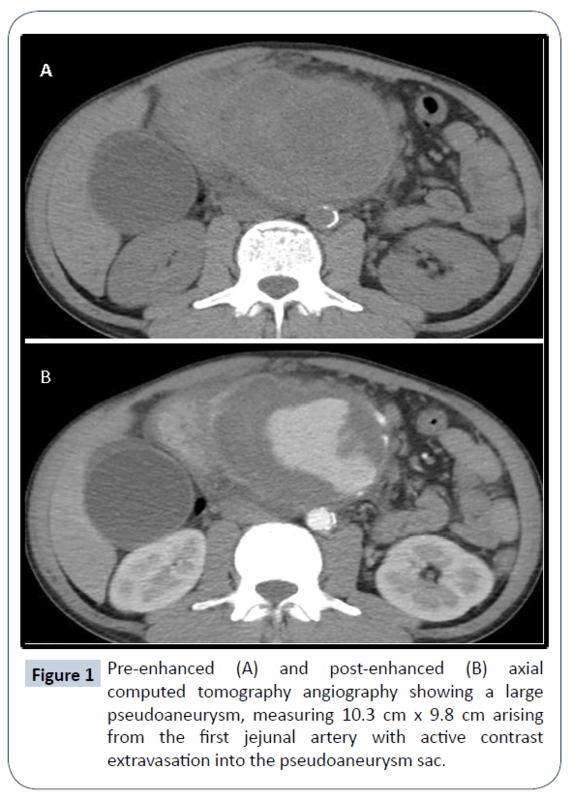 We present an unusual case of a gigantic jejunal pseudoaneurysm secondary to chronic pancreatitis, treated successfully with endovascular coil embolization. We also discuss the clinical presentation, diagnosis techniques, and the currently available treatment options for visceral pseudoaneurysms. We present a case of a 37-year-old male, admitted into our emergency department due to persistent, intractable epigastric pain. A physical examination discovered a sizeable pulsatile mass over epigastrium. The patient had a history of alcohol abuse with more than five bottles of beer consumption daily. He had on-and-off epigastric pain for the last two years and was diagnosed with chronic pancreatitis at local hospital out-patient-clinics. No other chronic illness or cancer history was noted. Laboratory studies showed severe anemia with a hemoglobin of 7.8 g/dL (normal range 13.4-17.2 g/dL), elevated amylase 122 U/L (normal range 18-100 U/L) and lipase 95 U/L (normal range 95 U/L). The acquired computed tomography (CT) angiography showed a gigantic (10.3 cm in maximum diameter in Figure 1) pseudoaneurysm arising from the 1st jejunal artery with active contrast extravasation into the pseudoaneurysm sac. Additional findings include chronic inflammatory changes of the pancreas with multiple abutting pseudocysts (Figure 2). Digital subtraction angiography (DSA) validated the diagnosis of jejunal artery pseudoaneurysm (Figure 3). Endovascular management was carried out with five mini-coils to obliterate the front and rear gates feeding the pseudoaneurysm. Post-embolization DSA demonstrated complete obliteration of the pseudoaneurysm (Figure 4). The patient had no re-bleeding episodes, nor ischemic bowel complications upon one year of follow-up. Figure 1: Pre-enhanced (A) and post-enhanced (B) axial computed tomography angiography showing a large pseudoaneurysm, measuring 10.3 cm x 9.8 cm arising from the first jejunal artery with active contrast extravasation into the pseudoaneurysm sac. 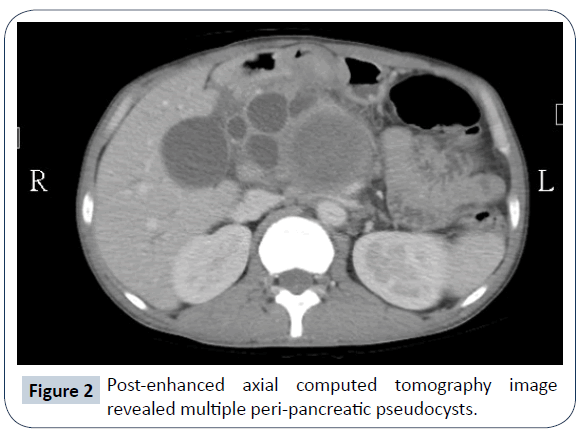 Figure 2: Post-enhanced axial computed tomography image revealed multiple peri-pancreatic pseudocysts. Figure 3: Pre-embolisation digital subtraction angiography shown contrast extravasation from the first jejunal artery (arrow). Figure 4: Postoperative angiography shows complete occlusion of the jejunal branch, with no filling of the aneurysmal sac. Visceral artery pseudoaneurysms are rare but have a high mortality rate due to consequential intraperitoneal or gastrointestinal bleeding. Unlike true aneurysms, which have the spontaneous rupture rate of approximately 20%, pseudoaneurysms have up to 70% of chance of rupture, with an associated mortality of 20 to 70% [1,2]. More of two-thirds of visceral pseudoaneurysms are secondary to pancreatitis, with the rest mostly resulting from previous trauma (including iatrogenic) or abutting infection . A total of less than ten cases of jejunal aneurysms and pseudoaneurysms are documented in the current literature, with authors suggesting diverse etiologies for their formations such as jejunal arterial fistula , gastroepiploic artery operation history , and intestinal tuberculosis . A recent case report also presented the largest jejunal artery aneurysm ever published, with the maximum diameter up to five centimeters . Our presented case is the largest size of jejunal artery pseudoaneurysms ever reported. We propose the noteworthy size is linked with continual irritation from surrounding chronic pancreatic inflammatory reactions, resulting in the increased elasticity and pliancy of the pseudoaneurysms/pseudocyst walls. Evidence to support our hypothesis is the relatively thickened and enhanced granulation wall of the gigantic pseudoaneurysm [10,11]. There are multiple imaging modalities to aid in the diagnosis of visceral pseudoaneurysms. Doppler ultrasound can be employed to survey for hypoechoic cystic lesions with proximity to an artery and evaluate active blood flow. CT angiography is performed to evaluate the anatomical structure as a whole and aid in the diagnosis and survey the viability of the endovascular procedure. DSA is the gold standard for the diagnosis of pseudoaneurysm because of the ability to real-time assessment of contrast extravasation. According to Habib et al., DSA has the highest sensibility (100%), followed by CT (67%), and ultrasound (50%) . In our case, both CT angiography and DSA demonstrated the pseudoaneurysm and the extravasation site. CT angiography provided us with additional information of multiple abutting pseudocysts resulted from chronic pancreatitis. The ability to survey the complete anatomic relationship and vessel diameters can provide insight for endovascular therapy. There is a broad consensus in the literature for aggressive treatment of pseudoaneurysms due to the high risk of rupture [11-16]. Surgical procedures such as arterial bypass, ligation, and excision of the aneurysmal sac of the involved arteries used to be the treatment of choice for visceral pseudoaneurysms ; however, recent advancements in interventional radiology have led to a noticeable shift in the trend toward endovascular and percutaneous methods. 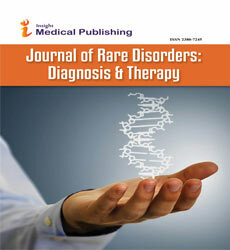 A systematic review performed by Pang et al. depicted higher mortality rates in the surgically treated group (50–100%) than those in the endovascular embolized group (13– 50%). However, the authors admitted to the bias that patients requiring surgical intervention were more hemodynamically unstable than those who underwent endovascular management . As a general rule, for vessels that supply on end-organ without multiple sources of blood flow, patency of the feeding vessel should be preserved to prevent ischemia. However, due to the nature of prominent collateral networks of visceral arteries, most pseudoaneurysms can be treated with embolization. Coil embolization is a commonly performed endovascular method to accomplish pseudoaneurysm embolization. Using the "sandwich technique," which deploys the coils at both the proximal and distal segments of filling artery adjacent to the pseudoaneurysm, the interventional radiologist can prevent collateral pathway refills and ensures optimal closure of the bleeding point . In theory, the jejunal artery has fewer arterial arcades when compared with other visceral branches, thus giving rise to the concern of increased risk of bowel ischemia. However, growing cases of jejunal artery aneurysm and pseudoaneurysm embolizations without bowel ischemia and recurrence are achieved and documented . We performed this technique for our patient successfully without any apparent complication. The patient had no re-bleeding episodes, nor ischemic bowel changes upon one year of follow-up. Covered stents also can be used to achieve sealing of the bleeding point, with the additional benefit of providing patent blood flow to the distal arteries and prevent distal organ ischemia. However, vessels with high tortuosity or unfavorable location can often limit the use of covered stents . Some authors also reported the lack of small caliber covered stents for small visceral arteries and the increased chances of infection especially under the particular circumstances for continuous peri-pancreatic contamination . Direct percutaneous puncture of the pseudoaneurysm followed by injection of thrombin is another alternative treatment employed by some physicians. Under the guidance of computed tomography or ultrasound, an experienced interventional radiologist can achieve comparable results with minimum morbidity and mortality . However, this procedure may not be feasible in terms of intestinal loop interposition and bulky dimension of pseduoaneuysmal sac as in our case. For patients with unstable hemodynamic, endovascular diagnosis and treatment may not be timely performed; an exploratory laparotomy should be performed to identify the source of bleeding. Surgical treatment should be chosen for cases diagnosed during laparotomy or in cases of prior unsuccessful endovascular treatments. The presented case report is unique due to the rarity of jejunal arterial origin and the size of the observed pseudoaneurysm. By understanding the etiology of visceral pseudoaneurysm, we suggest the persistent irritation from surrounding inflammatory reactions had increased the elasticity of the pseudoaneurysms/ pseudocyst walls, thus allowing for such a large pseudoaneurysm to be established. The choice of treatment options depends on the condition of the patient, the accessibility of the pseudoaneurysm, the risk of end-organ ischemia changes, and the availability of the optimized devices. Our case report offers an example of successful endovascular intervention for jejunal pseudoaneurysm in which surgical intervention is technically deemed challenging. Cappucci M, Zarco F, Orgera G, López-Rueda A, Moreno J, et al. (2017) Endovascular treatment of visceral artery aneurysms and pseudoaneurysms with stent-graft: Analysis of immediate and long-term results. Cir Esp 95: 283-292. Pitton MB, Dappa E, Jungmann F, Kloeckner R, Schotten S, et al. (2015) Visceral artery aneurysms: incidence, management, and outcome analysis in a tertiary care center over one decade. Eur Radiol 25: 2004-2014. Volpi MA, Voliovici E, Pinato F, Sciuto F, Figoli L, et al. (2010) Pseudoaneurysm of the gastroduodenal artery secondary to chronic pancreatitis. Ann Vasc Surg 24: 1136.e7-1136.e11. Yeo CJ, Bastidas JA, Lynch-Nyhan A, Fishman EK, Zinner MJ, et al. (1990) The natural history of pancreatic pseudocysts documented by computed tomography. Surg Gynecol Obstet 170: 411-417. Stanley JC, Wakefield TW, Graham LM, Whitehouse WM Jr, Zelenock GB, et al. (1986) Clinical importance and management of splanchnic artery aneurysms. J Vasc Surg 3: 836-840. Sonnenschein MJ, Anderson SE, Lourens S, Triller J (2004) A rare case of jejunal arterovenous fistula: treatment with superselective catheter embolization with a tracker-18 catheter and microcoils. Cardiovasc Intervent Radiol 27: 671-674. Shimohira M, Ogino H, Kitase M, Takeuchi M, Shibamoto Y, et al. (2006) Embolization for asymptomatic aneurysms of the first jejunal artery. Vasa 35: 198-200. Minaya-Bravo AM, Vera-Mansilla C, Ruiz-Grande F (2018) Presentation of a large jejunal artery aneurysm: Management and review of the literature. Int J Surg Case Rep 48: 50-53. Bavunoglu I, Ayan F, Karabicak I, Ledamo Y, Sayilgan C, et al. (2006) Selective jejunal artery pseudoaneurysm embolization in a patient with massive gastrointestinal bleeding due to intestinal tuberculosis. J Emerg Med 31: 391-394. Lo ZJ, Leow JJ, Tan KK, Tan GW (2015) Successful endovascular embolisation of ajejunal artery aneurysm. Singapore Med J 56: e46-e48. Yagmur Y, Akbulut S, Gumus S, Demircan F (2015) Giant Splenic Artery Pseudoaneurysm: A Case Report and Literature Review. Int Surg 100: 1244-1248. Habib N, Hassan S, Abdou R, Torbey E, Alkaied H, et al. (2013) Gastroduodenal artery aneurysm, diagnosis, clinical presentation and management: a concise review. Ann Surg Innov Res 7: 4. Loffroy R, Favelier S, Pottecher P, Estivalet L, Genson PY, et al. (2015) Transcatheter arterial embolization for acute nonvariceal upper gastrointestinal bleeding: Indications, techniques and outcomes. Diagn Interv Imaging 96: 731-744. Pang TC, Maher R, Gananadha S, Hugh TJ, Samra JS, et al. (2014) Peripancreaticpseudoaneurysms: a management-based classification system. Surg Endosc 28: 2027-2038. Suzuki K, Mori Y, Komada T, Matsushima M, Ota T, et al. (2009) Stent-graft treatment for bleeding superior mesenteric artery pseudoaneurysm after pancreaticoduodenectomy. Cardiovasc Interv Radiol 32: 762-766. Krueger K, Zaehringer M, Lackner K (2005) Percutaneous treatment of a splenic artery pseudoaneurysm by thrombin injection. J Vasc Interv Radiol 16: 1023-1025.